In 1990, Paul Marmet published an article in 21st Century, Science and Technology entitled “Big Bang Cosmology meets an astronomical death” that proclaimed the death of the Big Bang Theory. See http://www.newtonphysics.on.ca/bigbang/index.html Marmet argued that the abundance of light elements are produced during galaxy formation by nuclear reactions in the stars; the CMB radiation is simply Planck's blackbody radiation emitted by an unlimited Universe at a temperature of about 3 K; and galaxy photons undergo a non-Doppler redshift and lose energy based on the Photon-Atom Theory. Photon-Atom Theory is a variant of the Tired Light Theory proposed by Zwicky after Hubble reported his redshift measurements in 1929. Zwicky contended that the redshift measured was caused by galaxy photons losing energy in colliding with cosmic dust particles (DPs) in the intergalactic medium (IGM). Zwicky’s contention that the interpretation of Hubble’s redshift as a Doppler shift was fatally flawed marked the beginning of cosmological death of the Big Bang. Marmet claimed that most of galaxy light is absorbed and not scattered, and therefore photons lose energy by repeatedly being absorbed and re-emitted by atoms or molecules. Objects on Earth do not appear blurred even though light undergoes an uncountable number of absorptions with air molecules. Hence, Marmet claimed the non-Doppler redshift from the absorption of galaxy photons by moleclules in the IGM was the likely explanation of the redshift observed by Hubble and not that by a Doppler shift leading to an expanding Universe in the Big Bang Theory. QED induced redshift supports the death of the Big Bang Theory predicted by Zwicky and proclaimed by Marmet. QED stands for quantum electrodynamics. QED induced redshift is a consequence of constraints on the conservation of energy imposed by quantum mechanics (QM). QM precludes submicron DPs from having the specific heat capacity necessary to conserve absorbed galaxy photons by an increase in temperature. Photons are created from the electromagnetic (EM) confinement of the absorbed galaxy photon within the solid DP. See thumbnail. This may be understood from QM by the QED induced creation of photons of wavelength Lo by supplying EM energy to a QM box with walls separated by Lo/2. For a galaxy photon absorbed in a spherical DP of diameter D, the QED photons are created at a wavelength Lo = 2nD, where n is the index of refraction of the DP. In the IGM, the DPs are generally amorphous silicate having n = 1.45 and diameters D < 0.5 microns. For D = 0.25 microns, the QED created photon has Lo = 0.745 microns, and therefore an absorbed Ly-alpha photon having L = 0.1216 microns is redshift to Z = (Lo – L)/L ~ 5. If the QED redshift in DPs is interpreted by Doppler shift, the galaxy recession velocity is 95 % of the speed of light when in fact the Universe is not expanding at all. See www.nanoqed.org at “Dark Energy and Cosmic Dust” and “Reddening and Redshift,” 2009. Marmet and Zwicky contended that the redshift of galaxies generally increases with distance based on galaxy light continuosly losing energy by successive collisions with IGM molelcules. But QED redshift is prompt upon absorption of the galaxy photon in a single DP. QED redshift is therefore a more likely occurrence than the enormous number of collisions necessary to produce the same redshift by Photon-Atom Theory. Marmet estimated the energy loss in a single photon collision to be about 10-13 of the absorbed photon energy. For the Ly-alpha photon having a Planck energy of 10.2 eV, the energy loss per collision is about 10-12 eV. By QED redshift at Z = 5, the 0.25 micron diameter silicate DP redshifts the Ly-alpha photon to a red photon having Planck energy of 1.7 eV. By QED theory, the net redshift of 8.5 eV takes place in a single absorption. However, the Photon-Atom Theory requires about 8.5x1012 collisions which is far more unlikely than a single collision by QED induced redshift. The wavelength Lo emitted by a DP depends on the diameter and refractive index, and therefore the relative change in the wavelength L of the galaxy photon (Lo – L)/L is not constant: However, Tired Light theories claim a constant relative change in wavelength for all galaxy photon wavelengths consistent with Hubble’s Doppler shift. But there is no reason that non-Doppler and Doppler redshifts need to be the same. Nevertheless, QED redshift is still a Tired Light Theory. 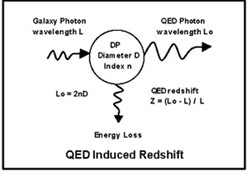 For galaxy photons of wavelength L redshift to Lo in a DP, the number of QED redshift photons created is the ratio of Lo/L and although greater than one is not likely an integer, and therefore QED redshift is similar to Tired Light Theories in that some galaxy photon energy is lost in DP absorptions as depicted in the thumbnail. Since 1907, spectroscopic measurements made of light from the Sun show the light from the limb to be redshift relative to that from center of the Sun's disk beyond that which can be explained by the Doppler shift of the Sun’s rotation. Marmet claimed the redshift arises from the greater number of photon-atom collisions in the greater distance the light has to pass near the limb. Similarly, QED redshift also predicts the light form the limb to be redshift more than at its center because the greater distance contains a proportionally greater number of DPs. 4. Tired Light Theories based on scattering produce blurring of the object image. Both Marmet’s Photon-Atom Theory and Zwicky’s DPs avoid this problem by the re-emission of absorbed galaxy photons. Similarly, QED redshift based on photon absorption in DPs does not produce blurring.